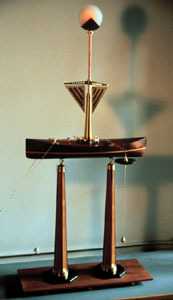 "Navigational Aid for Union Point", Instrument Series. Site Inspired Sculpture/Prototype for Floating lake works. Special Features: Illuminated Range Marker. Materials: Lacquered Honduras Mahogany, Birch; Machined Brass, Ebony, Tagua Nut, and Polypropylene Plastic; High Intensity LED and Electric Comp.